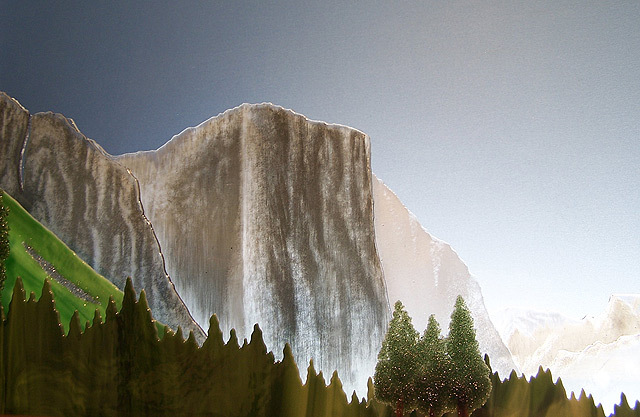 Here executed completely in fused art glass is the famous view of California's Yosemite Valley, complete with El Capitan, Half Dome, Clouds Rest, Sentinel Rock and Dome, and Bridalveil Fall pouring down from Cathedral Rocks. 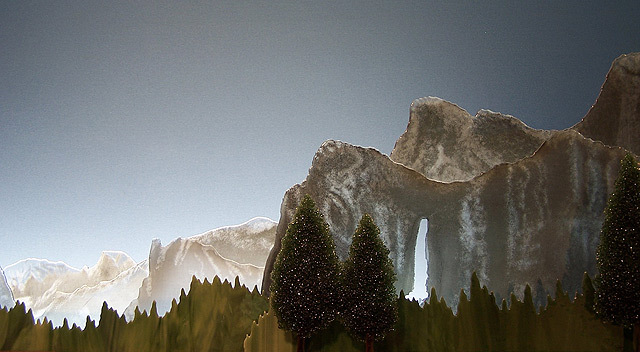 Details of this piece of landscape art are rendered primarily through the use of glass pigments reverse-painted and fused, as well as with frit—crushed art glass—arranged to achieve the textured look of individual conifers. The glasscape is illuminated either day or night by a light, recessed into the rear of the hardwood base, which is reflected off the wall behind. Limited edition of 25. Dimensions: 42" long by 8" deep by 13" high.